The Zebra conducted a national survey of young drivers to determine their perception of texting and driving. 55% of these same respondents thought it was illegal to text while driving in all 50 states. Young drivers reported feeling well-informed regarding their state’s texting and driving laws. However, the group’s responses showed most young drivers incorrectly assumed texting and driving had been outlawed across the United States. This indicates a knowledge gap among young drivers, especially those who live in states with strict texting and driving laws. 36% of respondents (aged 18-24) admitted to texting while driving. 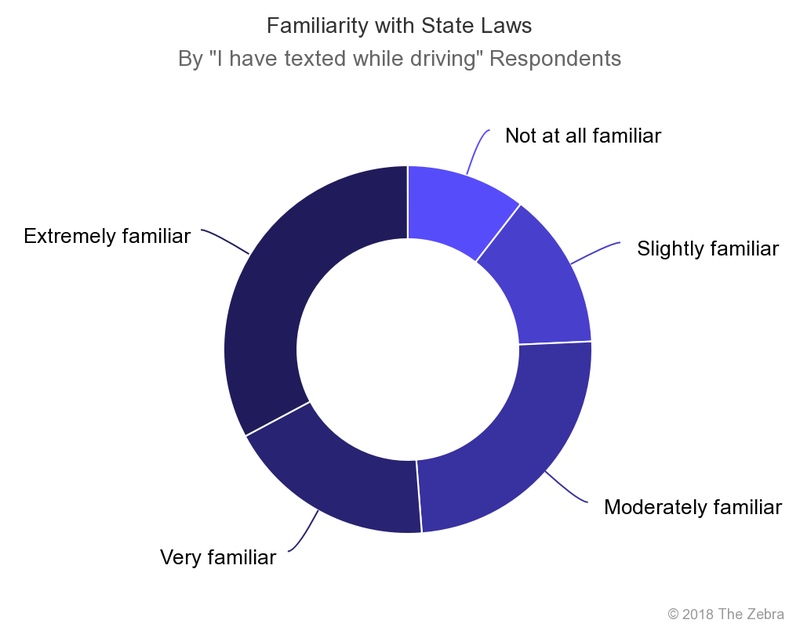 Of those who admitted to texting while driving, 51% said they were “very” or “extremely” familiar with their state’s texting and driving laws. 48% of respondents said they thought driving under the influence of alcohol was more dangerous than texting and driving. 48% of those surveyed said they thought driving under the influence of alcohol was about as dangerous as texting and driving. Young drivers who admitted to texting while driving were nearly twice as likely to continue to engage in cell phone use (including reading and sending text messages) than were other respondents. Using a GPS and sending a text message require similar behaviors and similar use of a device (including a hands-free device). But the use of a GPS device is more widely accepted as a benign behavior, compared to texting. 60% of respondents said they were likely to use a GPS app while driving. Only 7% of respondents who said they were likely to use GPS apps while driving also indicated they thought it was more dangerous than using a cell phone to text. The survey showed a knowledge gap among young adult drivers who feel well-informed about the law, aware of their ability to handle multiple tasks while distracted, and the reality of the dangers posed by various forms of distracted driving. The following data comes from the National Highway Traffic Safety Association, the National Safety Council, and The Zebra’s internal reports. A total of 47 states have a texting ban (Arizona, Missouri, and Montana). Only 16 states have a ban on handheld devices for all drivers. Fatalities involving texting while driving comprised 9% of all fatal crashes nationwide. 7% of drivers are using cell phones at any given time. Answering a text distracts a driver for approximately five seconds. At 55 miles per hour, that's enough time to travel the length of a football field. Texting while driving increases by 400% a driver’s time spent with their eyes off the road. Use of a cell phone while driving caused an estimated 1.5 million car crashes in the U.S. in 2017. 14% of fatal crashes involved cell phones. 14% of distracted driving deaths were attributed specifically to cell phone use, as opposed to other forms of distracted driving. 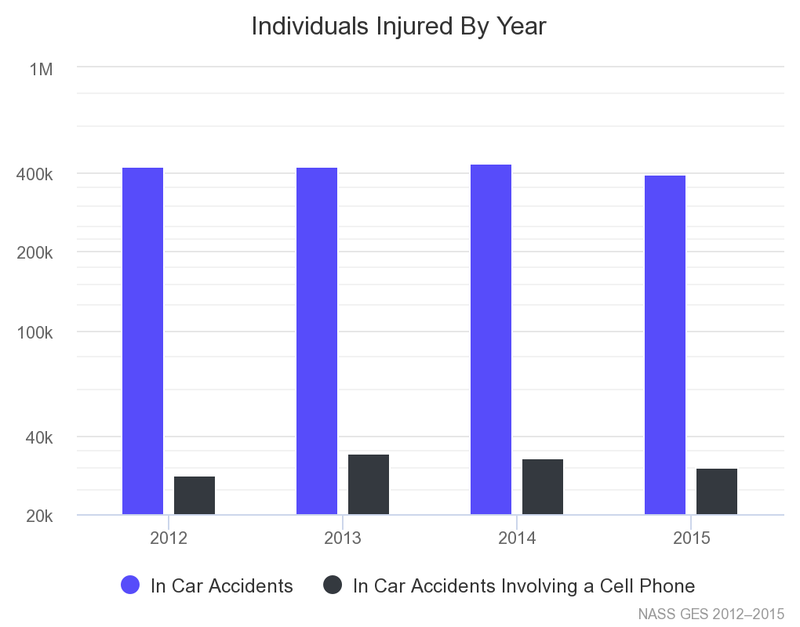 4,637 people died in car crashes in 2018 due to cell phone use. Including quality-of-life costs, these crashes were responsible for $129 billion — or 15 percent — of the overall societal damage caused by motor vehicle crashes. Men are about four times more likely to drink and drive, but women text and drive more frequently. Drunk driving causes about 10,000 fatal crashes a year. Using a cell phone while driving, whether it’s hand-held or hands-free, delays a driver’s reaction time by as much as having a blood alcohol concentration at the legal limit of .08%. More than half of respondents who admitted to texting while driving in The Zebra's 2018 survey have been exposed to AT&T's "It Can Wait" campaign and the dangers of distracted driving, but continue to engage in such behaviors. Drivers aged 20 to 29 were the most likely to report using a cell phone while driving. 40% of teen drivers said they have been in a motor vehicle when the driver used a cell phone in a way that put people in danger. Surfing the web is another form of distracted driving. Approximately 19% of drivers — including teens — engage in this behavior. Nearly one-third of older drivers (aged 18-64) admitted to being active text and email message senders. How does a distracted driving ticket impact car insurance rates? 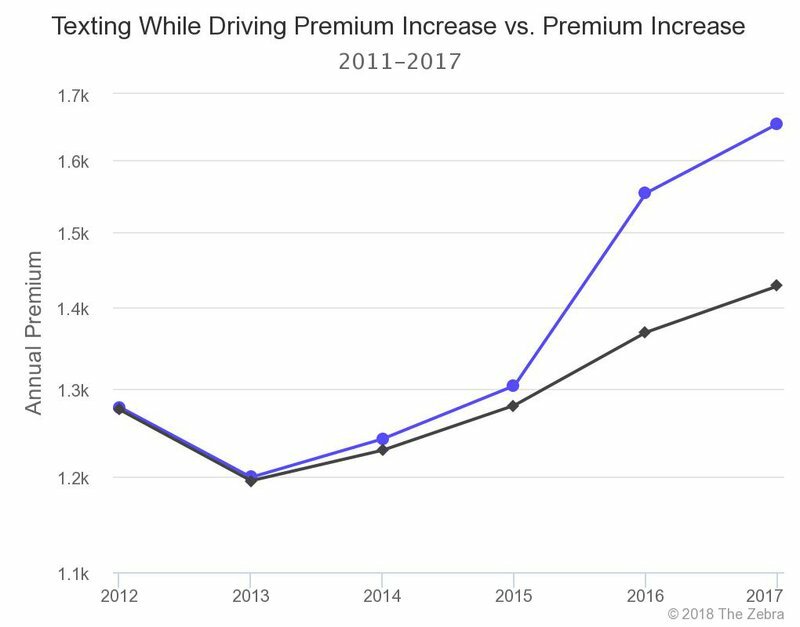 A ticket for distracted driving — sending a text message or using your cell phone while driving — raised a driver’s car insurance rates by 0.2% in 2011, costing the driver less than $3 per year, on average. Now, the same violation raises rates by 16% — or $226 per year. Insurance penalties for distracted driving have grown by nearly 8,000%. As of late 2017, insurers in all states penalized distracted drivers. In 2011, insurers in only 10 states raised rates after a distracted driving citation. Across the country, penalties for distracted drivers range from just $2.51 (New York) to $681 (Michigan). In some cities, the penalty nears $2,000. Learn more about the impact a ticket could have on your auto insurance rates. Copyright © 2019 InsuranceZebra, Inc. All rights reserved. For inquiries regarding this content, please contact our team at statistics@thezebra.com.